I know as artists we've all stumbled upon this quandry at one time or another where you see something you like and think, "Hey I can make that.. then the next question is, "But will I really?" and do I have time etc. etc. You know what I mean. Well this was one of those times for me. A friend of mine had come to work with this really cool vinyl bag and I immediately fell in love. Then after some precise fondling and carefully perusing over the details of how this bag was made I immediately sprung into action. I went to my desk, sketched the details and went to work. 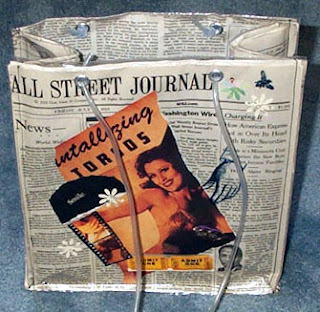 I already had the newspaper, I had collage material, I needed large grommets a sewing machine and aquarium tubing and ViOLa! A vinyl bag was born. Another view and both sides are collaged. So when the urge strikes, just do it! purchased her bag was Anthropologie a fine purveyor of drygoods. wow...this is amazing! will you put in on etsy? it will be popular! This is so cool! I love it! I think Emilia is right these would sell like hot cakes on etsy! Put my order in, too. This is way cool and soooo green. 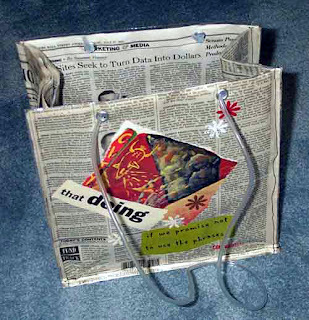 What a cool bag - yes, you CAN do it!